Switzerland forward Xherdan Shaqiri bolstered Liverpool's attacking options for 2018-19 after becoming the Reds' third signing of the summer. The 26-year-old wide-man, whose three years in the Premier League with Stoke City included 84 games, 15 goals and 15 assists, brought his creative talents to Anfield in a transfer from Stoke City. 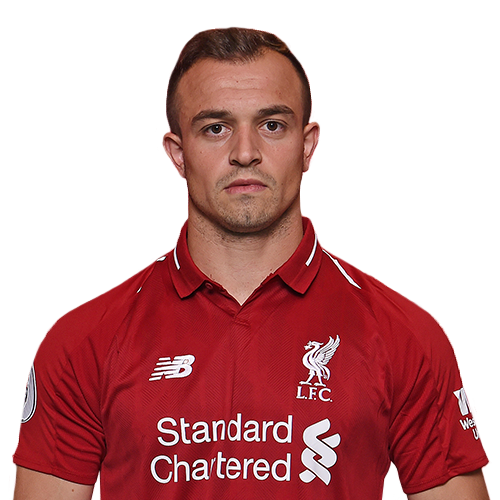 Scorer of a World Cup hat-trick in 2014, and with spells at FC Basel, Bayern Munich and Inter Milan on his CV too, Shaqiri is set to spend the peak years of his career with the Reds. His journey in senior football began with Basel in the 2009-10 season at the age of 17 – and it was a story of success from the off for both the player and the club. Shaqiri played 31 games and scored four times as the Swiss Super League title was secured by three points, and was on the scoresheet when the double was achieved courtesy of a 6-0 thrashing of Lausanne Sport in the Swiss Cup final. Back-to-back title defences followed, while another cup success in 2011-12 meant the young man’s collection of winner’s medals stood at five before his 20s had really begun. By now, Europe’s top clubs had noticed Shaqiri’s performances and Bayern won the race for his signature, sealing a deal in February 2012 for the 5ft6in star to move to Munich in time for the next campaign. A promising debut season on a personal level was matched by the collective, with the Bavarians scooping a remarkable treble of Bundesliga title, German Cup and Champions League – the latter at the expense of Jürgen Klopp’s Borussia Dortmund. His opportunities dwindled during the subsequent 18 months, though the trophies kept coming in the form of yet another domestic double, the UEFA Super Cup and FIFA Club World Cup. Shaqiri departed the Allianz Arena in January 2015 for what would prove a short-lived stay with Internazionale, before Stoke pulled off a coup to take the Swiss to the Potteries. The versatile forward’s penchant for the spectacular provided a fresh edge to a team evolving under Mark Hughes and his technical ability was exhibited through a series of fine strikes from distance and dead-ball situations. Strangely, Shaqiri’s most productive season for Stoke coincided with their relegation from the Premier League in 2017-18. He missed only two matches and hit the net eight times as the club finished 19th. International football provided some relief. Despite winning nine of their 10 qualifying fixtures, Switzerland were forced into the World Cup play-offs and he played both legs of the 1-0 aggregate victory over Northern Ireland. Shaqiri’s last-minute winner against Serbia during the tournament’s group stage was pivotal in taking his country into the knockout rounds, where they were frustratingly eliminated by Sweden. Shortly after returning from Russia, he sealed a long-term deal with Liverpool and will begin the next chapter of his club career under Klopp at Anfield.